You have discovered that, despite the years apart, your feelings for Corso are as strong today as they were when you were ripped apart. You have resumed your romance with Corso Riggs. You have decided that, despite your shared romantic history, you would break off your relationship with Corso Riggs. Corso Riggs tracked you down and attempted to reunite with you. You, however, were uninterested and sent him on his way. You no longer know his exact whereabouts. 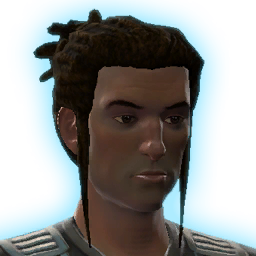 You have recruited Corso Riggs, the optimistic mercenary, to your Alliance. After reuniting with Corso and renewing your relationship, things have changed and you no longer care for him in the same way.